Most parents dread the thought of planning a children’s party – twenty excitable minors creating a playground out of your living room is not any parent’s idea of fun! Planning a successful children’s party needn’t be a chore – there are many ways in which you can ‘lighten the load’ and protect your prized ornaments! If you live in a small house and your child has decided to invite their whole class – book a hall. Many venues are inexpensive and can be hired for as little as £15 an hour. The extra space is useful when playing games and it also enables children to play happily in a safe environment. If you really want a hassle-free party book a children’s entertainer. Although they can be expensive, it will save you work and provide entertainment specially designed for the child’s age group. Entertainers can offer many forms of amusement such as magic shows, balloon modelling and face painting. Some businesses also offer mini discos and make-up parties; these are popular with older children. Children don’t eat as much as adults and it is important to remember this when purchasing party food. Many parents buy double the amount of food needed – much of this going to waste. Small sandwiches, raw vegetable sticks and breadsticks are popular with children and are healthy alternatives to crisps and sugary snacks. Many parents now provide ready-prepared ‘lunch-boxes’ for each child – these are sensible and drastically reduce waste. A children’s party should be fun – that’s what they are designed for! If children are amused and enjoying themselves they are unlikely to cause trouble. 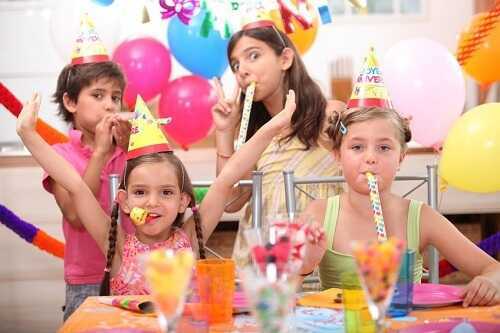 Many parents worry about planning ‘the perfect party’, but it needn’t be feared. Just make sure you look around for the best deals and ensure money is not wasted on non-essentials. Planning a successful party is easy – just remember to stay calm and enjoy yourself.